A team from Oasis recently headed down to London for the Christian Funders Forum and this is an update to tell you how we got on. For the past 18 years The Oasis Centre has been financially supported by hundreds of individuals, businesses and trust funds to help Oasis change lives for the better. Trusts and foundations make up around 50% of the annual funds needed to keep Oasis running. Many of the trusts and foundations who have supported us are part of the Christian Funders Forum which supports hundreds of Christian charities in the UK and abroad. Each year they give out around £30 million to Churches and Christian charities bringing God's love and hope to the people in their communities. ​On 7th November The Oasis Centre was nominated by some of these trust funds for 'Best Social Action Project' 2018. Victoria, Margaret and Abigail went down to London to be part of an incredible evening where Churches and Christian charities were celebrated for the work they are doing around the UK. It was an inspiring evening where they heard about so many amazing projects doing incredible work in their communities. It was humbling to be apart of such wonderful and passionate people. 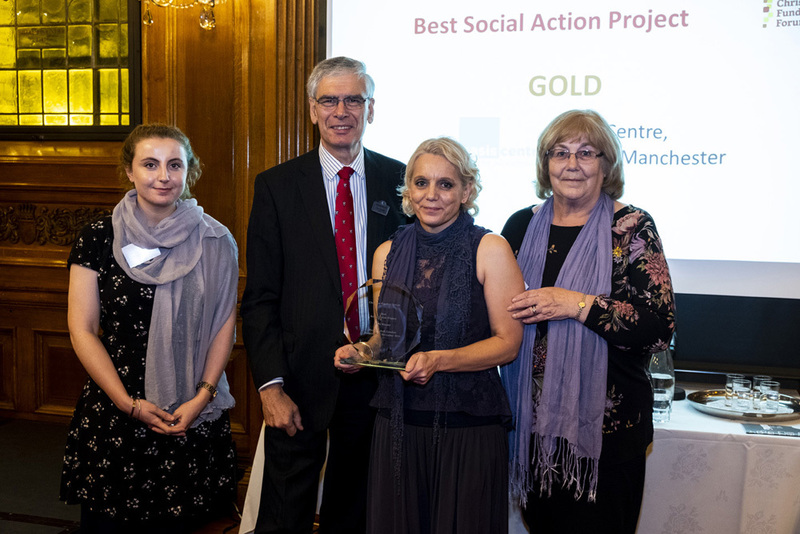 To our amazement and delight The Oasis Centre won 'Best Social Action Project' of 2018!! We are so grateful to the Christian Funders Forum for all their support. We would also like to thank all our staff, volunteers and hundreds of supporters, partners and well wishers who have walked with Oasis for the past 18 years helping us change lives for the better. ​Without your support we would not be able to carry out the work we do on a day to day basis. Thank you.